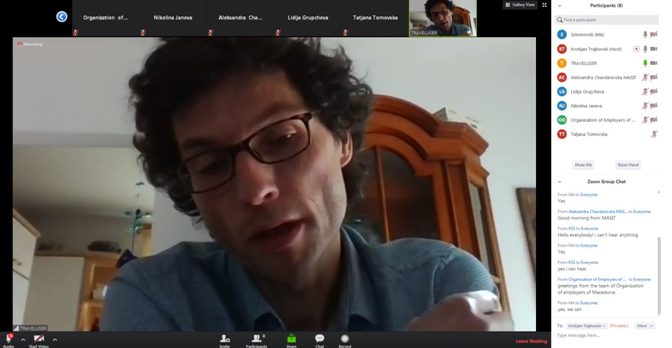 The idea of the webinar was to involve the social partners, policy makers, academics, representatives from the NGO sector in an open discussion with expert on industrial relations from old Member States of the EU, such as Germany. The participants had opportunity to listen to the lecture by Mr. Matthias Schäfer, expert in the field of social policy, public finances and labour market policies, who is currently the head of the Konrad Adenauer Foundation’s Economic Department. During the webinar Mr. Schäfer spoke about the German experience regarding the new forms of employment, mini jobs and the volume of gig economy in his country and presented various results from surveys regarding the percentage of people employed in non-standard employment relationship. Through this activity, our goal was to raise awareness of the impact of new forms of employment in developed economies and how they contribute to increasing overall employment as well as the inclusion of inactive workforce in the labor market.